Sunday evening, December 2011, Amtrak’s eastbound Empire Builder pulls into Williston, North Dakota, a fast-growing northern Great Plains city riding the lashing tail of an oil-drilling dragon. A crowd gathers on the station platform. Men coming. Men going. Big pickups rumble in the parking lot. Four years into a drilling frenzy that has pushed North Dakota to the top of the nation’s oil-producing states, the sound of Williston is diesel engines. The scent is diesel fuel. It is below zero, windless for a change, and exhaust vapors hang in the air. The swirl of men, talking loud and walking fast to warmed pickup cabs, is like a swift eddy in a strong stream. The currents of purpose and planning, assignments and destinations, are so keen it feels like a military campaign. A lot is at stake here — for this state, for the 35,000 men who’ve come from every corner of America to find work in the 18,000-square-mile oilfield, and for the nation. Williston — the population of which now measures an estimated 18,000, up 40 percent from a decade ago — is one of the epicenters of a national oil and gas drilling boom that is engulfing eight Great Plains states (as well as California and four states in the mid-Atlantic and South). A convergence of new exploration and drilling techniques, rising global demand and prices, and suspect governing oversight is producing what looks to be the most powerful surge in fossil fuel production in U.S. history, say state officials and energy industry executives here and elsewhere. From every vantage, the consequences are momentous. The Department of Energy recently reported that crude oil production in the United States has climbed to 5.88 million barrels per day, the most since 1998. After nearly three decades of steady declines, U.S. oil production has increased for three straight years, the first time that has happened since the 1970s. Oil imports are decreasing. And last year, refined petroleum products — gasoline, diesel, and aviation fuel — were the top American exports. The last time the U.S. exported more refined fuel than it imported was 1949. The fossil fuel sector’s swift and extravagant growth also has produced a host of new jobs. A new analysis of federal labor data, completed by Economic Modeling Specialists Inc. (EMSI), a labor market research group in Moscow, Idaho, finds that the oil and gas production sector employed 807,000 people in 2011 — an addition of 187,000 over 2005. EMSI also found that every new oil and gas production job generated two more energy-related positions in manufacturing, services, transport, and in other industries: 374,000 more jobs. In other words, the oil and gas boom accounted for 561,000 new jobs — or more than 20 percent of the nation’s new jobs since 2005. In a down economy, such numbers are impossible to ignore. Indeed, the energy sector’s advance across the Great Plains and other regions came with such speed and force that it surprised residents and regulators alike. Now environmental leaders and academics, along with a select group of state agencies and a number of federal units — the U.S. Fish and Wildlife Service (USFWS), the Department of Energy, and the Environmental Protection Agency (EPA) — have raised the alarm about the consequences of the drilling frenzy. A pad of ice four inches thick greeted Ron Ivory on a clear and cold December morning at the busy water depot south of Williston. Ivory is 47-years-old, a stocky and bearded truck driver from Vernal, Utah, with 23 years in the business. He’d been in North Dakota two weeks, working 14-hour days hauling fresh water, 130 barrels a load, to oil production sites. One of the reasons that North Dakota and the other big U.S. shale energy fields have generated so many new jobs is because drawing gas and oil from the Bakken formation — a thin but widespread shale layer roughly two miles beneath much of the state’s northwest corner — is as close as man has gotten to drawing blood from a stone. Thirty-five fracking crews work day and night in North Dakota now, and there are likely to be ten more before the end of 2012. Some 70 to 100 jobs are connected to a frack crew, according to the state Oil and Gas Commission. A few of those jobs involve operating the powerful fracking pumps. The rest are connected with transporting water from pumping stations like this one. There are dozens of water depots scattered across the territory, and the roads of western North Dakota are jammed with thousands of water tanker trucks. “Everybody is up here to make money,” said Ivory. But those profits come at a tremendous cost. In December, the EPA, which is preparing a study on the risks of fracking to drinking water, found persuasive evidence that the high-pressure, water- and chemical-intensive production practice had contaminated groundwater in Wyoming. The USFWS, in court documents filed in Bismarck, estimated that up to 1 million migratory birds drown or are poisoned each year after landing in the toxic soup of chemicals, drill cuttings, and drilling muds held in waste pits that accompany almost every drill site across the Great Plains. And it’s not just water contamination. A study conducted last spring by researchers at Cornell University determined that fracking releases large quantities of methane as “fugitive emissions.” Emmissions of methane, a much more powerful climate change gas than carbon dioxide, amount to approximately 2 percent of the natural gas released by a fracked well — 1,000 times higher than similar emissions of methane from conventional wells, said the researchers. For the time being, North Dakota officials and residents consider the economic riches worth the risks. “People say it’s generally a good thing,” said Mary Massad, chief executive and manager of the Southwest Water Authority, which supplies fracking crews with water. North Dakota’s energy companies are producing 500,000 barrels of oil a day from more than 6,000 wells. The resource is worth $45 million a day, at current market prices, and generates $4.5 million a day in state tax revenue, according to state officials. Production could top 1 million barrels per day sometime next year — placing North Dakota just behind Texas as the number two oil-producing state. But a number of economists and environmentalists assert that the big American oil and gas surge amounts to surrendering our economic and environmental future. After dark, beyond Williston’s last lit living room and heading east on state highway 1804, North Dakota’s landscape turns alien. Steel towers of active oil drilling rigs, flooded by lights as bright as a sports stadium’s, flank every steep rise. Bright orange flare gas fires, like flames on 20-foot birthday candles, break the pitch dark of every deep valley. The sound of ceaseless prairie winds and big trucks hauling water and drilling wastes and metal pipes is the background music of an energy industry that attracts thousands of workers — young workers — to a state that for decades shed jobs and its young adults. Last August, Jon Moore and Rick Harding migrated here from their hometown in Sandpoint, a small resort city in northern Idaho. They are both 26-years-old, unmarried, and have partners back home with young children. They also are ambitious. Moore is a big-shouldered man, earnest and hard-muscled from his days as a landscape contractor in Idaho. Harding is lean, compact, edgy, and with his tight goatee looks a lot like a young Sean Penn. They are western guys, at ease with the land and their new careers. Managing the water depots, handling the pumps and gauges, learning how to fix stuff came easily. During the long rides in the company truck between the depots, they plot out their futures in North Dakota and in business. “I think I’m here for awhile,” Moore told me, adding that he and Harding have a plan to become investors in the development. “Back home there was just nothing going on. We heard about North Dakota and came over to get jobs. It’s working out real well. But Moore and Harding aren’t blind to the cultural fissures opening, as the unrelenting pace of exploration and production creates environmental challenges and population growth overwhelms the region’s cities and towns. The state has counted over 1,000 oilfield-related spills of fuel, oil, saltwater, and waste — five times higher than the number of spills in 2004. Traffic deaths in western North Dakota in 2011 were double what they were in 2010, and injuries are 40 percent higher, according to the state police. A bad drilling rig explosion and fire in September killed two young workers and burned two others. Emergency medical and ambulance crews describe in published reports how picking up the pieces on the drill sites, highways, and man camps that have sprung up everywhere is like treating the wounded in a war zone. The Saturday morning that Scott Terrell and I had breakfast at Gramma Sharon’s Family Restaurant in Williston, every seat was taken by roughnecks and drivers fueling up on eggs and chicken-fried steaks before heading out to work. Terrell, a 58-year-old underemployed painter and carpenter from Coeur d’Alene, Idaho, joined the army of oilfield mercenaries last August. He quickly landed a job driving a Volvo haul truck on a heavy equipment construction crew that builds the flat-as-a-table, laser-graded oil drilling pads. There is plenty of work. Enbridge, the Canadian transport company, is building a $145 million expansion to its oil pipeline network in North Dakota. Burlington Northern is building prairie depots to load oil aboard unit trains that transport 100,000 barrels a day to the Gulf Coast. There are two proposals for new refineries. Last year alone, drilling companies punched 2,000 new wells into the North Dakota prairie. During the long light of summer, Terrell said, he spent 14 hours a day behind the wheel breathing dust. In the fierce cold, wind, and dark of the Dakota winter, he works 12-hour days. He earns roughly $7,000 a month. But the pace is relentless and dangerous — and it leads to accidents, like the explosion on the drilling rig in September. “I could see the smoke on the horizon,” he said. Terrell, who is tall and more fit than the average guy his age, described his time in North Dakota with a kind of burdened sigh, Just driving to and from work is hazardous, he said. During the first year of operation every drill site is served by an average of 2,000 round trips by big trucks hauling equipment, chemicals, men, water, and other materials. With 2,000 wells drilled in 2011, that’s nearly 110,000 round-trips to well sites every day. In short, the highways in western North Dakota are packed with big trucks moving fast — the principal cause for the increase in highway fatalities. Terrell said he’d been around long enough to contend with other risks, too. In early December, his crew discovered that diesel oil and chemicals had been illegally dumped into a waste pit they were reclaiming at a drilling site. The crew dug out tons of contaminated soils, loaded the toxic mess aboard trucks, and shipped it to a regulated disposal site. But such incidents are on the climb as more and more workers come from outside the region, with no longtime connection to the land and no plans to stay, and limited oversight produces little in the way of consequences. “It happens and nobody knows who’s doing it,” Terrell said. When we finished breakfast, the line of customers waiting to pay their bills was so long that I simply left cash on the table and slipped out. I felt a little guilty doing it, like I was violating the ethos expressed on the hand-lettered sign next to the cash register. Please be patient, it said in plaintive neat cursive. We are short-staffed every day. Lynn D. Helms — bearded, lean, and genial — looks nothing like the rock star he’s become in the American oil industry. Helms spent 20 years earlier in his career as a roughneck and petroleum engineer. Now he is the director of the state Department of Mineral Resources, the agency charged with both promoting and regulating oil and gas production. In 2011, the condition of the waste pits used by drillers was at the top of his list of concerns — and for good reason. During the winter of 2010–2011, his agency counted roughly five hundred open waste pits full of drilling muds, chemicals, diesel fuel, and brine-saturated water. Such pits were allowed by state law to be kept open and full of liquid for a year. During a run of heavy snowmelt and flooding in North Dakota in the spring, though, 40 pits overflowed. Twenty were severe enough to contaminate land and some surface water beyond the drill sites. Helms said his agency issued $3 million in fines. North Dakota is set to implement new regulations in April to require companies to build much smaller pits that contain only dry materials and no liquids. State rules also require the pits to be covered by nets to prevent wildlife from drowning or being poisoned. A number of companies didn’t comply. Last summer, the Justice Department, with help from the federal Fish and Wildlife Service, filed cases against eight companies under the Migratory Bird Treaty Act for deaths of waterfowl at drilling sites. Three companies pled guilty and paid small fines; three others are contesting the charges. The case against a seventh company was dismissed, and one case is under seal. The growing number of prosecutions is worrisome, said state regulators; it suggests that fines for environmental regulations are regarded as a standard business expense. Helms is sensitive to this charge — especially in light of the built-in conflict in his own agency. The dual charge of promoting oil and gas development and enforcing all regulations governing drilling and production is essentially the same operating system as the old federal Minerals Management Service, a unit of the Department of Interior that promoted and regulated offshore drilling in the Gulf of Mexico before it was disbanded following the Deepwater Horizon disaster in 2010. Despite Helms’s assurances, the phalanx of industrial equipment required to wrest oil and gas from the deep shale is utterly rearranging the big sky landscape. Buck Hill is one of the tallest points in Theodore Roosevelt National Park, which spreads across more than 70,000 acres of grass and tight canyons south of Williston, where North Dakota meets South Dakota and Montana. Several weeks ago Valerie Naylor, the park superintendent, hiked to the summit and counted six oil-drilling platforms. Fortunately, drilling will not occur inside the park. U.S. National Park Service policy forbids oil and gas exploration in any national park, so all production activities are occurring beyond the park’s boundaries. The same can’t be said for the Dakota Prairie National Grasslands, a 1.259 million-acre stretch of wildlands in southwest North Dakota and northern South Dakota. The grasslands are administered by the U.S. Department of Agriculture, which is busy leasing federal minerals and preparing permits for at least 90 drill sites. Landmen, the advance guard of the industry, swarm county clerk offices, too, hoping to lock up private mineral leases. 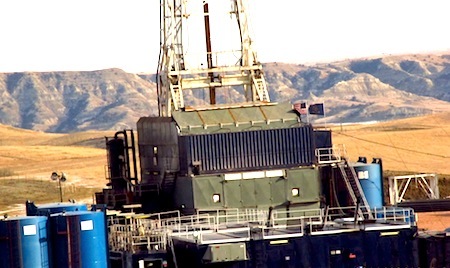 Drilling rigs are poised to advance into South Dakota in the spring. The Bakken formation in North Dakota and Montana — and its related Three Forks and Tyler shales in North Dakota, Montana, South Dakota, and Wyoming — are said by geologists to contain nearly 30 billion barrels of recoverable oil. The boom, far from abating, may be just getting started. To understand how powerful the energy rush is in North Dakota, just stand for a few minutes at any place alongside U.S. route 85 north or south of Williston. Semis hauling heavy equipment, pipe, water, fuel, oil, rigging, and any number of other loads roll past, an unyielding train of oil field gear and supplies and products. And in the spaces where there aren’t semis, there are pickups hauling men back and forth to the drill sites. Five years ago, say townies, U.S. 85 in early December was as quiet as a dance floor on Tuesday morning, and the small towns of western North Dakota were drying up like shallow lakes in the desert. Now people are predicting that Williston, where fewer than 13,000 people lived a decade ago could reach 35,000 by 2020, maybe 100,000 after that.